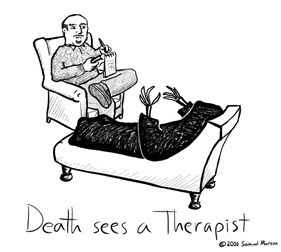 Here's the original version of Death sees a Therapist. I was later told that in couch-style therapy the patient typically sits facing away from the therapist. The solution was a quick cut and paste job, but if you look at the therapist's pants on the finalized version of the cartoon, you can see where my fill jobs didn't line up. I like the structure of this cartoon better than the final version, but realism is realism, I guess.